A SATA connector and a 3pin Asus connector come with the RGB hub meaning you can control your LED light through your motherboard or other supported devices As well as the RF controller. Giving you more control! You can enhance your cooling further with room at the front for a radiator up to a 240mm radiator, at the top a radiator up to 240mm and at the back a radiator up to 120mm. This gaming case has good compatibility, it supports ATX, Micro ATX, Mini ITX and supports ATX power supply up to 240mm in length to give you unlimited options. On the top of the case for easy access is 1 x USB3.0, 2 x USB2.0 and HD audio allowing you to connect to a variety of devices. 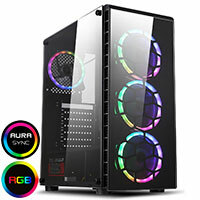 Stylish Exterior - 4mm thick tempered glass front panel and a full tempered glass left side panel not only gives the Raider a professional look but allows you to show off the lighting coming from your Spectrum fans. Fans - Supports up to eight fans with four Dual-Ring Halo Spectrum fans included to give your case some added colour in your finished build. Water-Cooling Support - As well as supporting eight fans the Raider supports a radiator up to 240mm at the front, at the top a radiator up to 240mm and at the back a 120mm radiator to give you extensive cooling support. PCB Hub - A PCB hub is included and can fit up to 10 devices, 8 5pin fans and 2 LED strips. The PCB hub comes with a SATA connector for easy connectivity and a 3pin ASUS connector is also included connecting to your motherboard so you have the choice of how you want to control your LED's. RF Controller - The RF remote controller included gives you the option of six single colours and several different lighting modes so you can stand out from the crowd. With the remote controller being RF it makes it easier and more efficient when you come to change your LED lighting. I\O Ports - Easy accessible 1 x USB2.0, 2 x USB 3.0 ports on the top with transfer speeds of 5Gbps means you can connect to a range of media devices. Removable Dust Filters - A dust filter on the top and bottom of the Raider helps to prevent dust from getting into your build and helps improve the performance of your chassis.